The commissioners selected William James Smith, the assistant surveyor for the Crown estates in London, for the task of rebuilding the embassy palace. He had started his architectural career in private practice and had joined the Office of Works as a professional assistant in 1830. He spoke French and Italian, and had a Spanish wife. Smith worked quickly after his arrival in Constantinople in 1841. 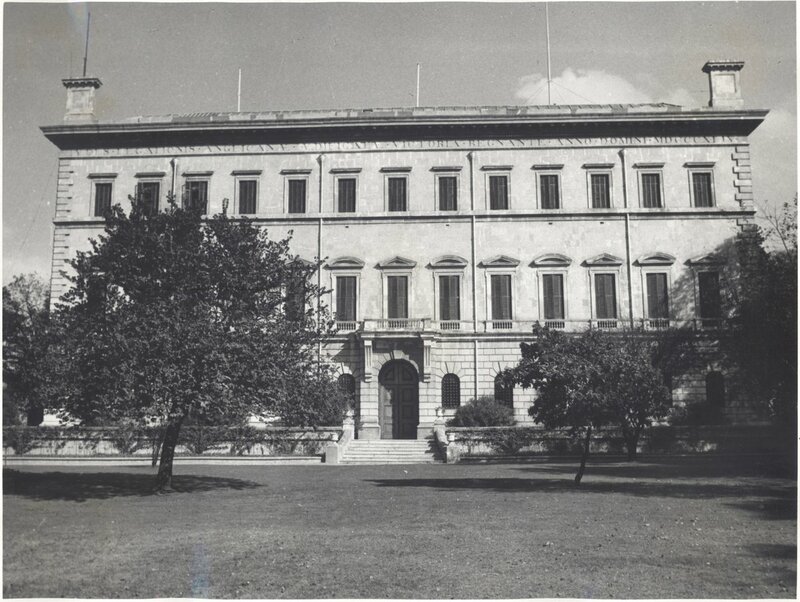 Within a month or so, and despite the lack of any cooperation from Ponsonby, who was on the point of leaving, leases were signed on two adjacent stone houses in Galata, the old commercial town below Pera, to serve the embassy until rebuilding at Pera was complete. 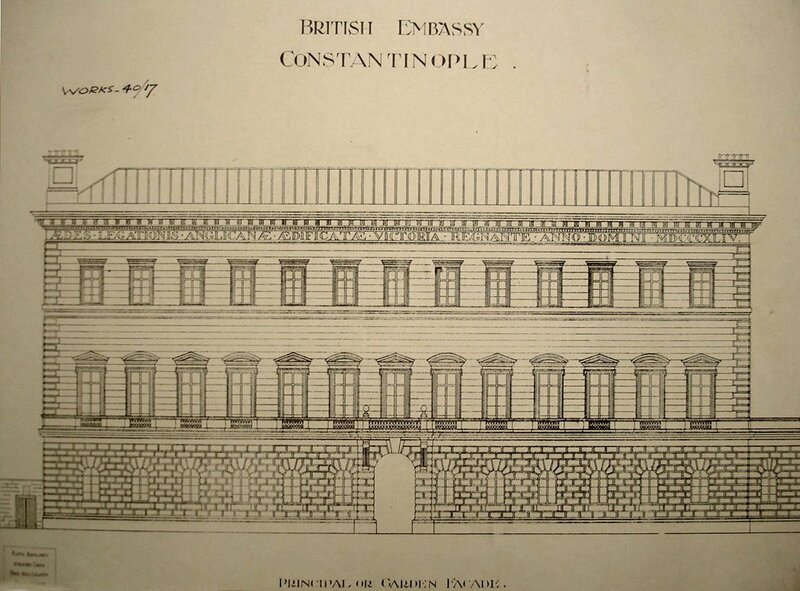 Smith was instructed to remain in Constantinople until Sir Stratford Canning, on his second appointment as ambassador, arrived in early 1842, and he developed a design for the replacement embassy building. Smith returned to London in late 1842. At the end of November, he was instructed to take his design forward into working drawings and to produce an estimate of cost. While Smith was working on these drawings, the Office of Works asked its consultant architect, Charles Barry, then hard at work on designs for the new Houses of Parliament, to comment on Smith’s proposals for Pera. This request for Barry’s advice may have given rise to the belief that Barry designed the embassy at Pera. When Barry first saw it, Smith’s design was already based on a courtyard and already expressed in a renaissance revival manner. The extent to which Barry caused Smith to modify his design is uncertain, but the strong probability is that Barry suggested various amendments informed by his recently completed Reform Club building on Pall Mall, in London. The only firsthand mention of any design contribution by Barry appears to be a minor item in a collective and retrospective fee account rendered five years later, in 1848, ‘for advice and assistance to altering and modifying Mr Smith’s Design’. Barry thought that Smith’s estimate of £46,000 was ample. A figure of £45,000 was therefore adopted and, assuming that sale of the Pera site would yield £12,000 more than the cost of acquiring a new site, an estimate of £33,000 was laid before Parliament. Aberdeen approved the design in April 1843, and asked for immediate progress. By that time, and without alteration to the estimate, an attic floor had been added to the design of the building. 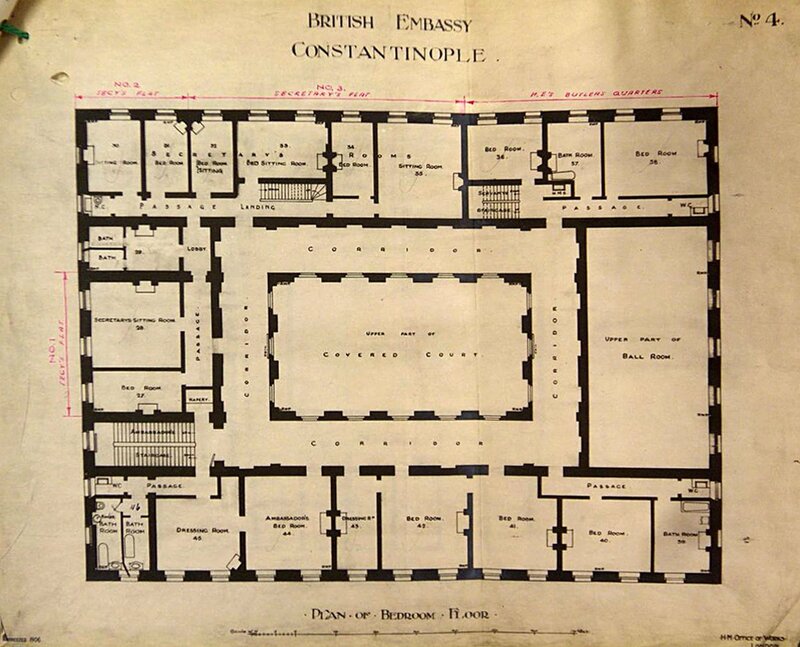 Smith returned to Constantinople in July 1843 as the superintending architect: arrangements were made for him to be supported by a clerk of works, Luke Richardson, and two foremen for masonry and carpentry work. 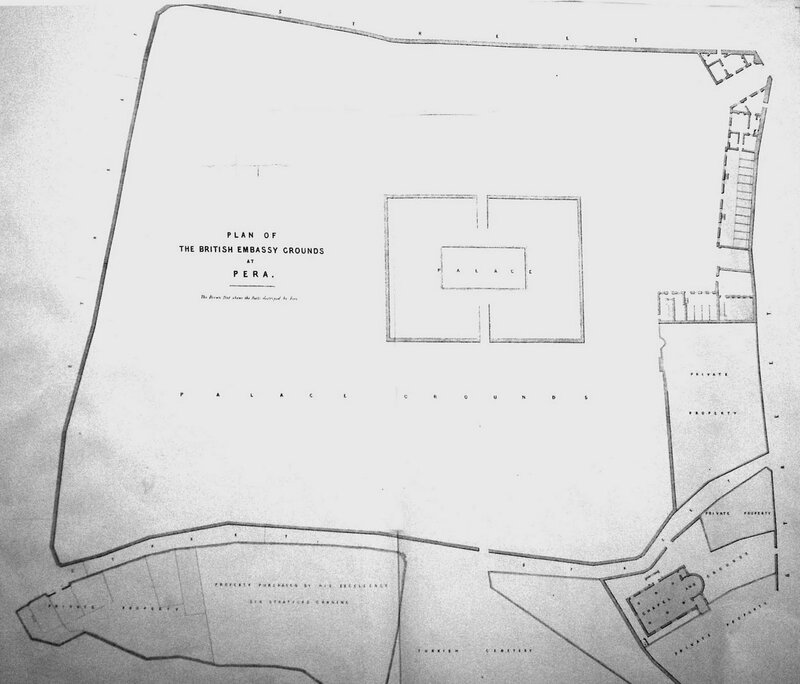 Eventually, in June 1844, it was decided to revert to the existing Pera site, where Smith’s design could be comfortably sited to rest much of its weight on Elgin’s original foundations. The new building was to rise four storeys to about 70 ft. at the cornice. In appearance, this ‘quoined, rusticated, urbanely attired building was little different from its fashionable Italianate contemporaries in England’. Smith took possession of the site on 21 August 1844, almost exactly thirteen years since the day of the fire. Construction started quite well although Elgin’s foundations were soon found inadequate and had to be excavated more deeply and expensively than estimated. Smith’s difficulties mounted over the stonework. He had expected to obtain, and had priced for, good stone from a local quarry but access was now denied him because the sultan’s building works required all of the quarry’s output. The best alternative he could find was a limestone from a quarry five hours’ journey away. He also found that the local labour was much less skilled than anticipated, mainly because the Sultan’s building managers were luring away the better craftsmen, if not literally carrying some of them off, especially once they had been trained by Smith’s English foremen. Valuable raw materials were wasted by unskilled craftsmen. Canning was sturdy in support of Smith. By August 1845, one year into the job, the external walls were up to the first storey; by May 1846, many of the walls were up to cornice level and the ceiling of the saloon was being constructed; and by October 1846 the slaters were at work on the roof. At this juncture, Smith, having had no leave for over three years and feeling sick, was given permission to go to Carrara to sort out marble supplies for the grand staircase and take some recuperative leave. Smith returned to the site in spring 1847 in better health and spirits. The main structural works were by then complete, but 1847 was the year in which progress stalled and recriminations began. With the hulk now in place, Canning began to see the need for extras, the most inconvenient and expensive of which were fireproof iron window shutters on two whole sides, for which he procured the support of Palmerston, now Foreign Secretary again. A fire in the autumn seriously damaged some of the outbuildings and destroyed materials from England, for which replacements would take months to arrive. Other delays were incurred by many of the papier mâché architectural enrichments for the state rooms arriving crushed. At the end of 1847, however, the chief obstacle to progress was financial. Smith submitted in December his estimate that completing the palace would bring the total cost of the project to about £17,000 more than the original provision of £45,000. Additionally, arranging the gardens and repairing the burned outbuildings would together cost a further £11,000. This forecast of overspend came as a significant surprise to London. Palmerston called for an enquiry and the Office of Works turned to Charles Barry again for a review of the history of the project. His report in August 1848 concluded that ‘I must fairly say, that under these circumstances, I am surprised to find the works have been executed at a cost so little beyond the amount of the original Estimate … which, in my opinion, could not have been effected but for the judgement, discretion and constant vigilance that must have been executed on the part of the Architect.’ This endorsement did not stem the mounting criticisms of Smith, though he retained the support of Canning, who successfully pressed Palmerston to obtain a further vote of funds to keep the work going. 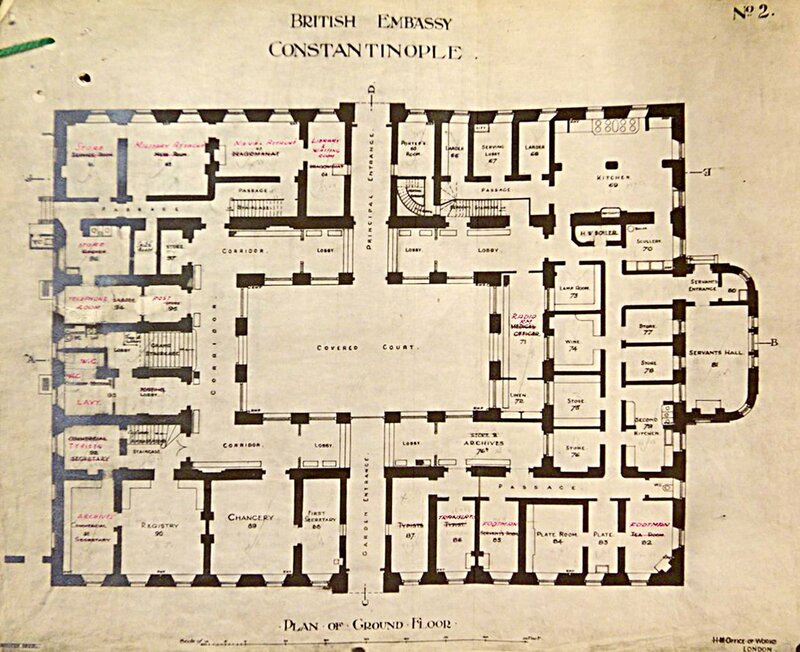 Canning and his family moved into the second floor of the unfinished building in October 1848, soon after his return to Constantinople after a two year absence. His support of Smith waned from that date, as he looked for signs of progress and saw only delays, with Smith appearing to lose resolve. Canning began to suspect that Smith and his foremen were no longer giving the palace their full attention because their work on the side for Turkish clients was growing. These suspicions were justified. Smith was steadily taking on more work, including possibly for Sultan Abdülmecid himself, without any longer seeking the agreement of the Office of Works and the ambassador to do so. Worse, Smith was no longer refusing offers of payment or gifts from Turkish clients for his work. On the other hand, Smith was also by then responsible for the consular projects that the Office of Works wanted undertaken in Galata, as well as for the rebuilding of St Helena’s chapel in the Pera grounds. In addition, money for the new embassy was tight; work was sometimes suspended by London until more satisfactory explanations for cost exceedings had been provided; glass and other materials, some ordered two years previously, had not arrived from England; and Smith was finding the management of all the bits and pieces of finishing the building, and preparing for its furnishing, less to his taste and abilities than the excitement of walls and roofs. Taking all this into account, very little progress was made during 1849. Nevertheless, ‘The gentlemen attached to HM’s embassy’ followed their ambassador into occupation of the unfinished building in time for the winter of 1849-50. Canning was planning to use the state rooms on the first floor in April 1850, although much of the furnishings and furniture for them had not yet even been ordered from London and would take almost another year to arrive. By 1850, therefore, the falling-out between Canning and Smith had reached the stage that they were only in contact through Count Pisani, the head dragoman. Canning gave his version of Smith’s and his foremen’s activities and shortcomings at great length to Palmerston in December 1851. Smith gave his side of the story to the Office of Works the following month. Smith seems to have been oblivious of the ambassador’s operational requirements, which were the sole reason for the house. Canning told London that ‘On every ground both of public interest and official consideration it is time that Mr Smith’s conduct should be brought to some conclusive test.’ After enquiries, the Office of Works exonerated Smith but concluded that it was time to withdraw him from Constantinople. It agreed that he could return home by easy stages so as to improve his health, and it gave him back his previous job in London. He left Constantinople in May 1853, after ten years in the city. 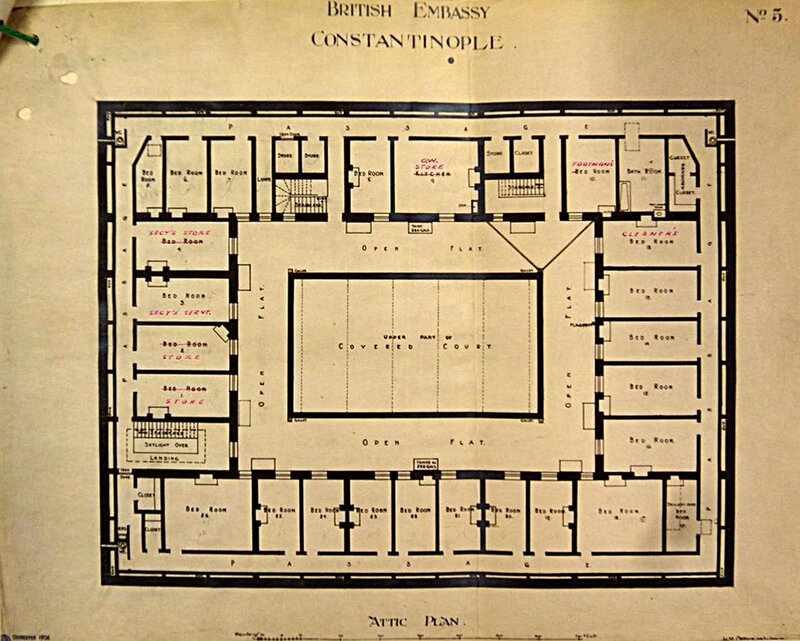 The Office of Works sent a Robert Hayden to complete and furnish the Pera building, and an architect, Henry Pulman, to take over all the consular projects at Galata, though it continued to call upon Smith’s advice in London about all aspects of works in Constantinople for the next two years. The total cost of the embassy house, including furniture, turned out at about £80,000. It was finally occupied in all its glory in 1855. Canning, ennobled in 1852 as Viscount Stratford de Redcliffe, celebrated its completion, as well as the ending of the Crimean War, with a huge ball on 31 January 1856, at which Sultan Abdülmecid was guest of honour. 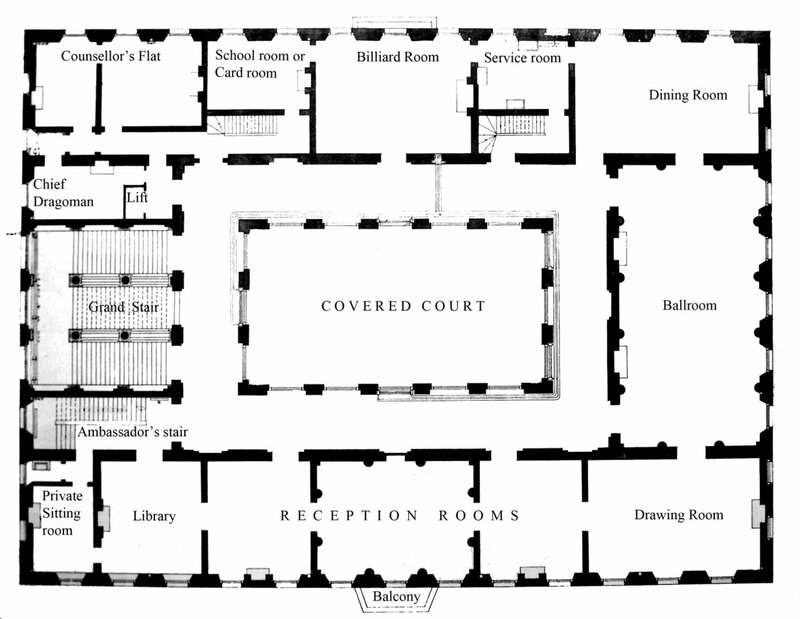 Principal (first) floor plan (1906). Second (bedroom) floor plan (1906). Attic (third) floor plan (1906). 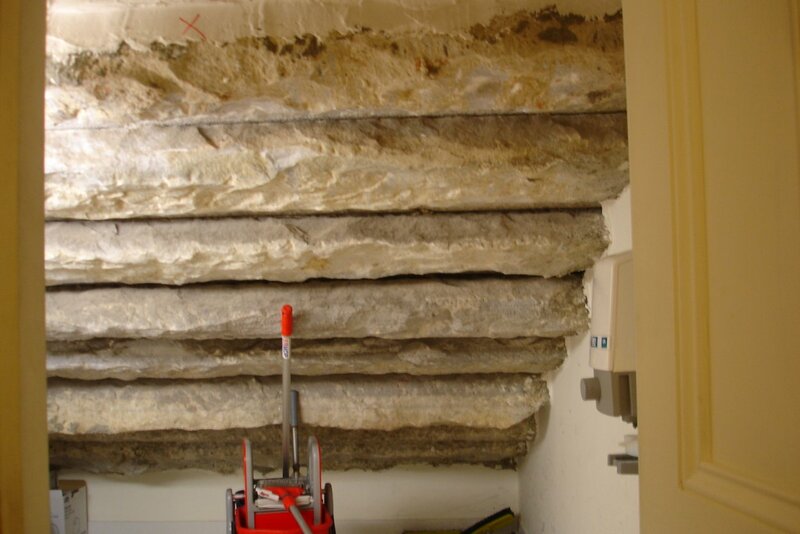 Underside of marble steps of Smith’s grand staircase (2007).